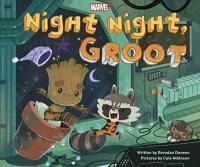 Before Groot can go to bed, Rocket requires his help saving the galaxy. New York : Marvel Press, 2017. Description: 1 volume (unpaged) : color illustrations ; 23 x 27 cm.